Designer Stitch is developing a set of Let’s Sew Together patterns that are designed to be sewn with a novice or friend that you can help along the way and share the love of sewing with. 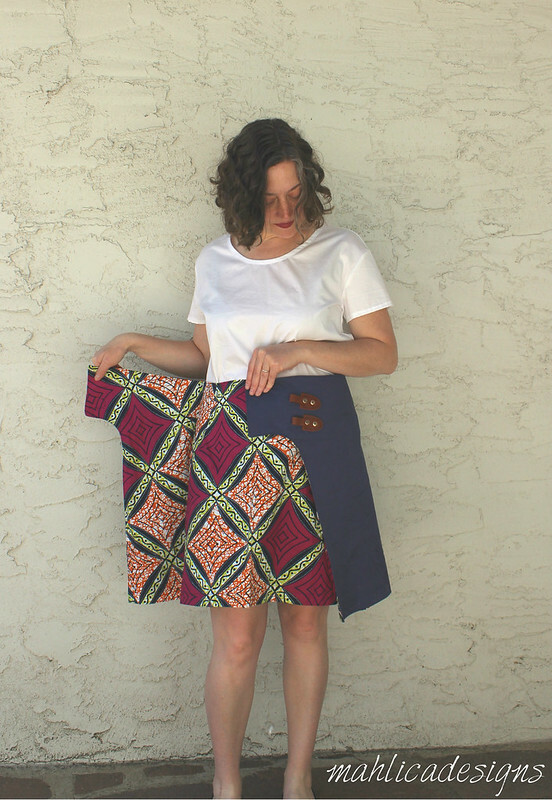 The concept of having a line of patterns that are beginner friendly and bring people together is so lovely and Ann of Designer Stitch really hit the mark in the first implementation of her idea- the Lily Wrap Skirt. The design is interesting with the two sides that fold over each other, reminding me of origami and there’s something about the shaping that brings to mind mathematical curves and lines. The Lily is not only a beginner friendly pattern but it is thoughtful in its design to make it easy to help someone brand new to sewing. For example: 1. A 1/4in seam allowance is used along the curved edge with the tab. The narrower seam allowance removes the need to clip along that curve saving time and construction steps. 2. Using hook and loop as a closure is simple and easy to apply and much quicker that other types of closures. 3. The need for fitting is minimized. You may need to adjust your darts, but no alteration to fit the width of your waist or hips is needed in this design. 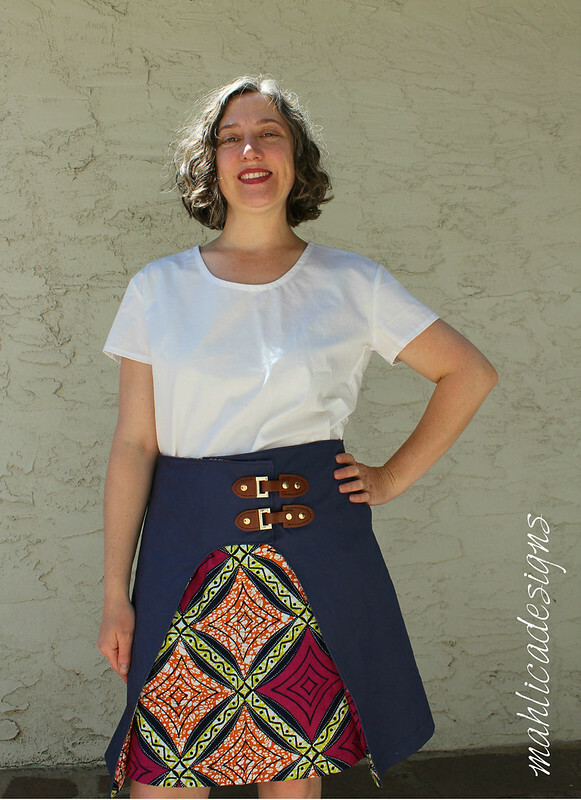 The Lily also works because it’s a great project to use fun fabrics with and heck, a reversible skirt is fun for all ages. After making the Lily, I have a few notes on how to add some of your intermediate sewing skills to the project. 1. Upgrade your closures. I used buckles and a hidden slide clasp because I’m not planning on wearing mine as reversible. Sewing with D used some really cute buttons on hers. 2. Add a facing or interface your waistband edge. The waistband is a turned over edge, I think this is probably fine for most, but I just feel like I need a little more support in my waistband. How to partake in the fun without a “novice” to sew with you. 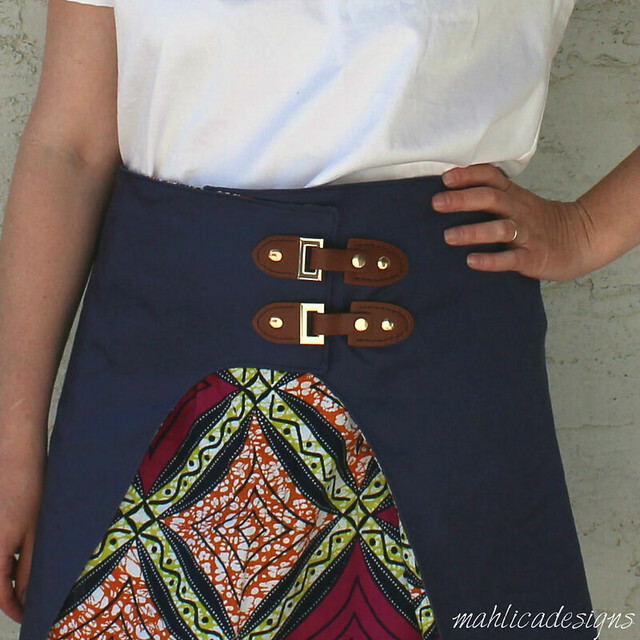 The timing wasn’t right for me to work with someone who would need a little help learning to sew the Lily skirt, so I explored two other options. Firstly, I paired with Diane of Sewing with D to talk through the process using video chat in facebook messenger. Secondly, since Elizabeth of Elizabeth Made This and I live in the same city, we arranged to do a sewing meet up to work on our skirts together. In the initial chat with Diane we talked about the pattern, fabrics, and ideas we were considering. We were able to work out any questions we had about the pattern, get a second opinion about fabric choices, and of course just chat about whatever. Our second video conversation took place after we both had most of the construction completed. We talked about what we might do differently the next time we made the pattern, shared pictures of button and buckles we were deciding on and gave our opinions, and of course more sewing chit-chat. Most of my sewing friends are online, so I really liked having the video chats with Diane, whom I’d been acquainted with for some time, but never actually spoken to or met with in person. Meeting with Elizabeth in person was another fun way to work on the project. We shared some tea and cinnamon rolls and then as two moms with limited sewing time are want to do, got right down to the business of sewing. Now neither Elizabeth or I need hand holding, but it is really nice to be able to say “what are you doing here”, or “how are you coming along on this step” and so on. So much better than talking to myself in my sewing room. Thanks Elizabeth and Diane for being my sewing buddies on this project! 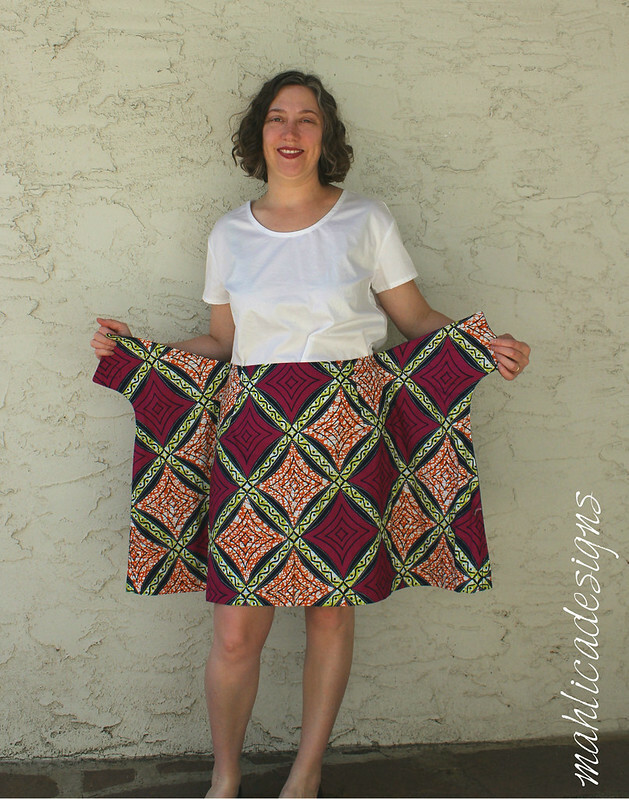 The Pattern: Lily Wrap Skirt in size 4. I shortened mine by 4in to hit above my knee. The Fabric: Navy cotton sateen and a cotton wax print from my stash. As always, thanks for reading today. You can follow me on instagram, Bloglovin, or by entering your email in the right side bar. This post may contain affiliate links, if you purchase through my links I get a small commission to help pay for my sewing hobby. Pin this image, so you can come back when you’re ready to start sewing your version. What I like most about the Tracey Bee are the insert details. These create interesting design lines if you sew it up in a solid fabric and opportunities to mix fabrics if you like colorblocking. I made my Tracey Bee with a rayon challis type of fabric. The drape is wonderful, but it did get a little clingey with static around my waist. Instead of a double fold hem, I decided to use a cotton bias binding and that seems to have helped the fabric stand away from my skin enough to resolve the problem. The Pattern: Tracey Bee Top** in size L, cropped view. Due to the challenge of sewing inserts, I’d recommend this top for an advanced beginner or above. Other than the challenge inserts can offer, the pattern goes together easily. There was a small mismatch at the side seam when the dart was folded, so I sewed the dart at half the width and that resolved the mismatch and didn’t affect the fit for me in the least. (the designer is checking the pattern to correct). The Fabric: Rayon woven paired with scraps of teal eyelet from the ole stash. I’m still having a hard time getting excited about a next sewing project, but starting with fabrics in my stash that do give me some energy is a good strategy. I do wish it was warm enough to wear my spring projects instead of just looking at them. Breaking News: our tour sponsor Phat Quarters is offering 2 patterns of choice from her pattern shop to one lucky winner. We’d love to see how you’re Breaking Ground this month. Share with us what you’re working on by using the hashtag #BreakingGround2019 across social media. **This post may contain affiliate links. If you purchase through my links, I get a small commission to help fund for my sewing hobby. Breaking Ground blog tour 2019- Kick Off! Double the fun and join the Sew Alongs & Sewing Contests facebook group to sew along with the Breaking Ground theme for the entire month of March. In the group you’ll find support and encouragement for your projects and fun themed challenges. As always, thanks for stopping by today. I picked the Phinney Ridge Cardigan and the Magnuson Vest from Straight Stitch Designs as my prize in The Monthly Stitch‘s Indie Pattern Month contest. Of course I really wanted to sew up both right away, but the cardigan gets first try in this cozy cardigan sweater knit that I got from DG Patterns fabric shop. I really like the V neck line and the deep cuffs of the Phinney Ridge. The cardigan looks really cute with buttons down the front, but I never button my cardigans and I’m afraid to do button holes on knits, so I go without. To make my Phinney a little more interesting I used a faux leather for the cuffs and I just love it. The Pattern: Phinney Ridge Cardigan from Straight Stitch Designs in size medium per her sizing chart and graded to size 12 at the hips. This one is an easy sew and well put together. The instructions have you sew each side of the neckband seperately starting from the bottom and moving toward the center back of the neck. This thoughtful step keeps the neckline looking very nice. I basted each side and then finished the seam with my overlocker. The Fabric: Cardigan sweater knit in cashmere grey. This sweater knit has a small weave making it pretty stable and there is a soft and fuzzy feel on the right side. 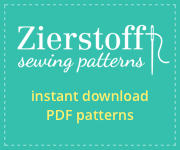 *As a DG Patterns Fabric Ambassador I receive complementary fabric from the DG Patterns fabric shop to use any way I like in exchange for sharing about it with you. This post may contain affiliate links. If you purchase through my links, I get a small commission to help fund for my sewing hobby. Save For Later: Pin this image, so you can come back when you’re ready to start sewing your version. Ok, so I had this great idea to make myself the Euler Bralette from Sophie Hines. A soft around the house bra was the goal and if it worked out well maybe, just maybe I could use the pattern to help make my first handmade swimsuit for this summer. Gathering all the right materials from different sources was kind of a pain and I made some wrong purchases in the process. The smartest move I made was picking up a bra strapping kit from Simply By Ti when ordering my fabrics. The kit includes the strapping, rings, and sliders all sized to work together. I might recommend buying a bra kit for your first attempt so you have an idea what to look for in future bra supply shopping. The construction of the Euler was pretty easy and I appreciated that I didn’t necessarily have to complete the bra in it’s entirety before knowing how it was going to fit. You can baste the side cups to the side elastic to make sure there’s no gaping. You can also baste the cups to the underband and the straps to the band at the back to check the positioning and strap length. The Euler is constructed to hide all the seams and raw edges and gives instructions for adding trims and details. You’ll want to read through the instructions first, as the instructions to add trimmings come after the standard instuctions to complete a step. I made the cobalt & black cotton lycra version first to match up with a pair of Jalie undies I made last year. I used the bra strapping from my Simply By Ti kit for the straps and along the sides of the cups. The firmness is just right for the straps but a little too firm for the sides. For the underbust elastic I ended up using Dritz 1.5in soft waistband elastic. The softness is nice but it is not quite firm enough as there is a little bit of buckling at center front. Where I struggled with the Euler was in the sizing. The size chart is based on bust measurement- no cup sizing like some bras- putting me in a size medium. The medium fits ok for my cup size, but I would like a little more coverage. The cutting chart for the elastics was very off for me. I had to cut my straps down 3in and still had extra length to work with. The underbust elastic needed to be shortened 3in at center back, and I used about 1in shorter elastic at the side cup than instructed. The lesson here is to measure it out on you before cutting so it fits your body’s unique shape or be prepared to waste a little on the first try. In my second attempt (the grey & black) I used the medium size again but widened the neckline edge out to the xxlarge cutting line to give me a little more coverage. Good idea right? Well only sort of. When I did this I also ended up making the side edge longer and shifting the strap placement toward my center front and that makes it fit a little weird. Totally my mistake. I hope this pic illustrates the problems I created for myself. In the grey version I used Dritz 1.5in ribbed nonroll elastic for the underbust and followed the pattern instructions to make a self fabric covering. This nonroll elastic is just right. It’s a good width and is just firm enough to support the bra and feel comfortable. I used a picot trim in the neckline seam and at the cup sides too. Going forward I think what I need to do is reshape the neckline edge of the size medium to give me more coverage so I can keep the good strap placement and proper length at the side. The Pattern The Euler Bralette is from designer Sophie Hines. The Cobalt version is a size medium based on my bust measurement and altered as described above The grey is a med/xxlarge as described above. Underwear are Jalie 3242 womens bikini w/ my own colorblocking. The Fabric Cobalt, black, and grey cotton lycra jersey and bra strapping kit from Simply By Ti** I made the cobalt/black pair of Jalie underwear about eight months ago out of Simply By Ti’s cotton/lycra, so I am confident the fabric is going to work well for these underwear sets and hold up well over time. **As a Simply by Ti Ambassador I receive complementary fabric from the Simply By Ti shop to use for a project in exchange for sharing it with you. Save For Later Pin this image, so you can come back when you’re ready to start sewing your version. Join us on Instagram for a virtual New Year’s Eve party! We have hosts across various time zones. Be sure to follow everyone on Instagram now so you don’t miss any of the fun tonight! The party runs from 9pm to midnight in each time zone. We will have discussions and giveaways running throughout. You can enter the giveaways on Instagram or via the rafflecopters below! Use the hashtag #sewinthenewyear to join the conversation! Thank you to our MST Sponsors! Amelia Lane Designs Blue Dot Patterns Bubble Baby Custom Fabrics Cotton Cuts DG Patterns Dinkydoo Fabrics and Notions Dressew Duchess and Hare PDF Patterns Ellie and Mac 5OutOf4 Patterns George and Ginger Glam Sprouts Fabric Green Style Creations Hearthrob Threads Helen’s Closet Made By Jaime Peek a Boo Pattern Shop Phat Quarters Pretty Posh Prints Quiet Book Queen Rain City Pattern Co Ragamuffin Patterns Rebecca Page Seams Like Style Seen and Sewn Patterns Sew Blessed SimplyByTi Stitchin Pretties So Sew English Suco By Susana Surge Fabric Shop The Fab Clique The Fabric Fairy The Fabric Market The Handmaiden’s Cottage Twig and Tale Winter Wear Designs …and more! Come and join in the fun! See you there! The Tessa Sweater Dress I made to share this week helps me get close to having all the winter wardrobe pieces I need this year. I really like wearing dresses, but it can be hard to feel warm enough in the cold months, so I’m hoping a nice sweater dress will do the trick. When Daniela listed this ribbed sweater knit in her shop, I knew I wanted to try sewing with it and hoped it would work for a sweater dress. I’d not sewn a dress with sweater knit before, so I was a little concerned that the length of the piece would cause the fabric to stretch and lengthen when worn. In this case I believe the structure that the ribbing offers and the smaller weave keep things in nice shape. My plan was to sew up the Tessa Dress last minute to wear for Thanksgiving. I’d look nice, be comfortable all day, and have room for an expanding belly. I came down sick just before the big day and only just got the meal prep I was responsible for complete with the help of my husband- thanks my dear. Sewing was not happening when I just wanted to crawl into bed, so the Tessa and I missed Thankdgiving. No worries though, I got to wear her to my office Christmas party last week and had a wonderful time. The Pattern: I used the Tessa Sweater & Dress Pattern from DG Patterns in a size 10 based on my measurements. Through the hips I graded down to an 8 for a closer fit. Depending on the stretch of the fabric, I could easily sew up a straight size 8 next time. The Fabric: Striped ribbed sweater knit (similar) from the DG Patterns shop. You might also like the Lazo Trousers I made in the DG Patterns’ Organic Tencel. *As a DG Patterns Fabric Ambassador I receive complementary fabric from the DG Patterns fabric shop to use for a project in exchange for sharing it with you.